Ask The Placenta Lady is a show about the birth year. Pregnancy, birth, and postpartum recovery – no question is too strange for The Placenta Lady! Joining us today is Molly Jinnette, a PBi Placenta Encapsulation Specialist® from South Carolina. 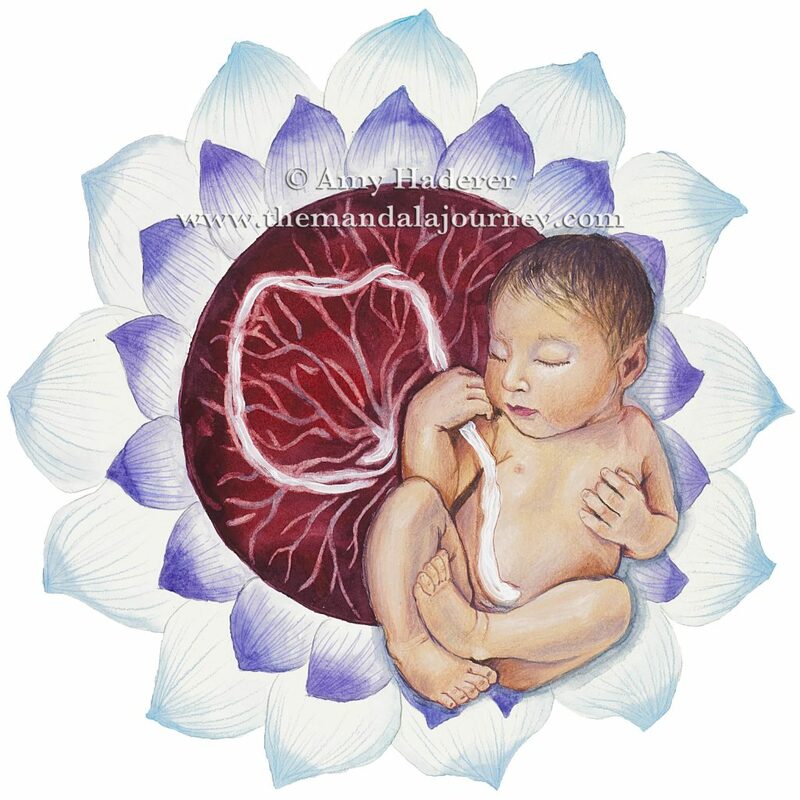 Some people would like to do a lotus birth, but also encapsulate their placenta later. We describe how you can do a modified lotus birth, and do a variation of both! Joining me today is Molly Jinnette, a PBi Placenta Encapsulation Specialist® from South Carolina. Welcome to the show, Molly. [Molly]: Thank you so much. I serve moms of upstate South Carolina and of Western North Carolina. I’m so glad to be here today. That’s so awesome Molly. Thanks for being here. Our question for this episode is, what is a lotus birth? And can I still use the placenta and do placenta encapsulation even if I do a lotus birth? Now, Molly, you are perfect for this episode, because as I understand it, you are currently pregnant and are planning doing a kind of a modified lotus birth, yes? [Molly]: Yes indeed. We’re very excited about it. I’m excited to share it with everyone. So, a lotus birth – we’ll start off with what a normal lotus birth would look like. A lotus birth is simply umbilical non-severance. So, baby stays attached to the cord, cord stays attached to the placenta. After baby is born, typically the placenta is put into a bowl or a bag or sometimes a waxed cloth. As baby is getting those first few drops of colostrum and nursing, the placenta is, that’s the time it will be prepared. It’s prepared with salts and herbs and spices to help it dry out as quickly as possible. However, none of that is put on the cord. It is only put on a placenta. 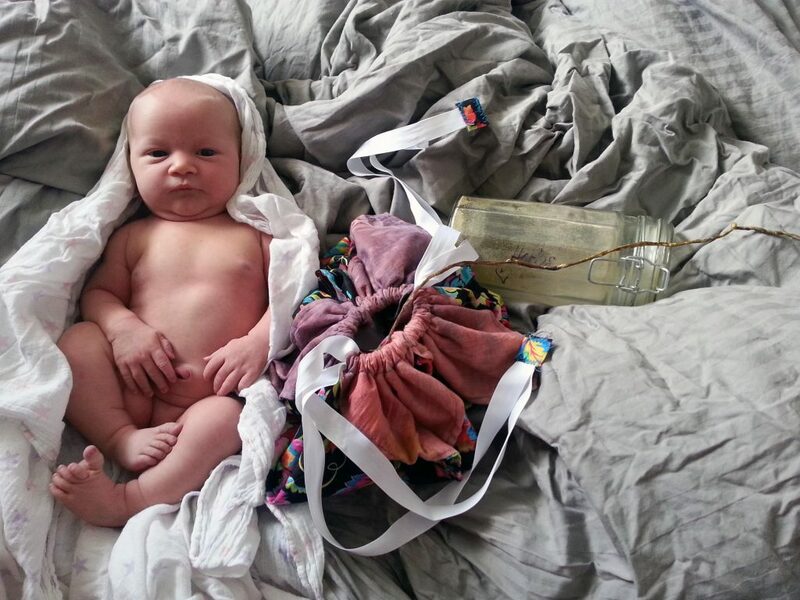 Photo of Lotus Birth, By Rose Fisher. Now, after that is done, the put in a really pretty, little satin bag and the baby’s all wrapped up in her swaddle blanket, the mother and the placenta and the baby are actually all swaddled together for a really beautiful four to five hours of uninterrupted sleep, wow, after working so hard for birth. And then, after that, usually the placenta, the baby and the mom will be put into a sits bath. At that point the placenta is usually in a bowl, floating next to you, it doesn’t get put in the water, but a sits bath can be a nice closing part of the lotus birth. Closing of the mother, closing of birth, closing of everything that you’ve just mentally gone through. So, reasons for a lotus birth. There are two ways people kind of go. There’s the spiritual way and there’s the way of just, they want life to slow down a little bit because it will take about 10 days for the cord to fall off naturally. So you’re not going to Target with your baby and a bag of a placenta. You’re going to stay home, you’re going to heal, life is going to be slower especially if you have siblings, you need things to just slow down. Typically, that’s more why people choose lotus birth nowadays. A lot of people believe that energetically, the baby is still bonded with the placenta therefore that shouldn’t be cut so soon. It’s a much gentler way of entering into the world and the baby actually goes through a bit of a loss period when the placenta is taken. However, many people also believe that the baby energetically feels through the umbilical cord so cutting it actually causes the baby pain. It’s a matter of opinion. There’s not really any more information on it than people saying this is what we experienced, this is what we believe when it comes to spiritual practices of a lotus birth. But that is where a lotus birth originated in was spiritual practices. For our modified lotus birth, so that I will be able to encapsulate my placenta, is going to be just a slightly different. We will not be able to use any herbs and spices to dry our placenta out. Simply because you’ll be washing them off very soon and certain herbs are harder to wash off and if they’re taken in by the mother, it can dry out breast milk and vaginal tissue which needs to be moist for healing purposes. Our house needs to slow down, we definitely do and that’s a big reason why we’ve chose to do this. Our doula has been asked to stay for the four hours that we are going to sleep, and then after we wake up she is going to help us. We will tie a string around the cord, the cord will be cut and then it will be prepared for encapsulation. Probably put in the fridge first. I’ll most likely be tired but we will be swaddled together, the baby will have a nice smooth transition into this world. We’re really excited about it! [Jodi]: That sounds like a really beautiful tradition and a great way to kind of segue from pregnancy through the birth and then into having a newborn. And as Molly just explained so eloquently to us, that you can still kind of honor that transitional space and then still also encapsulate your placenta. If you’re planning to ingest the placenta, whether that’s with encapsulation or something else, you do want to get the placenta into the refrigerator within about four to five hours of the birth. You do want to get started, if you’re planning to ingest the placenta, whether that’s with encapsulation or something else, you do want to get the placenta into the refrigerator within about four to five hours of the birth. So you wouldn’t be able to do the full lotus where the placenta is dried and then the cord releases naturally because then of course, the placenta would not be suitable for encapsulation or ingestion and you would want to have some soft of a, whether you bury it or do something else with the placenta at that point. Did you have anything that you would like to add to this Molly? I guess I was kind of curious, did you do this with a prior baby or is this going to be your first time doing a lotus birth of any kind? [Molly]: We did not do this with our first baby. We have only one little girl. We did encapsulate my placenta and I have been promoting placenta encapsulation for the past six years because it was just wonderful and such a great experience and the first lady who did my placenta was just, did so much more than just come to my house, encapsulate my placenta and leave. She really sat down with me and explained so many things that even me, being someone who grew up in the alternative way of birthing and life, she told me so many things that I needed to hear and didn’t know which were really great. But with this one, this will be our first try at doing a modified lotus birth and my birth team is very excited and they are all on board with me. They have not done a lotus birth or anything similar so they are excited to do this with me and it’s be an experience for them as well. [Jodi]: That’s fantastic Molly, I’m really excited for you and we’ll definitely have to do some sort of a follow up to hear how it does. [Molly]: I love to do pictures, and we’ll show how the birth went and how things were wonderful. [Jodi]: Fantastic. So what I would like to know is if somebody who’s in the areas that you service would like to get a hold of you, what is the best way to reach you or contact you for any of your postpartum services that you offer? [Molly]: Really the easiest way to contact me would go to the PBi website and the directory. All my information is there. Every way you could possibly get a hold of me is there and I always get back to my clients within 24 hours of them emailing, calling, however you decide to contact me. [Jodi]: Thank you for being on this episode of Ask the Placenta Lady, Molly! And thank you for tuning in. Remember – Ask the Placenta Lady, no question is too strange for the Placenta Lady! Our easy way to contact us is AskthePlacentaLady.com. You can always find more information about placenta encapsulation at our main website which is PlacentaBenefits.info. 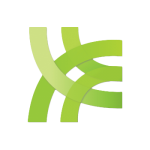 On Facebook and Instagram, we are @PlacentaBenefits. 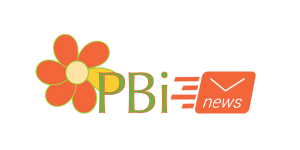 An easy way to find Molly or any of our other PBi Placenta Encapsulation Specialists® would be on our providers directory, and an easy URL for that is just Placenta.Directory. Thanks for joining us and find us next time on Ask the Placenta Lady. We’re also on Facebook at Placenta Benefits. I’m on Twitter @PlacentaLady. And Instagram @PlacentaBenefits. Thank you so much. Subscribe to our channels for the next episode of Ask The Placenta Lady, or send us your question!